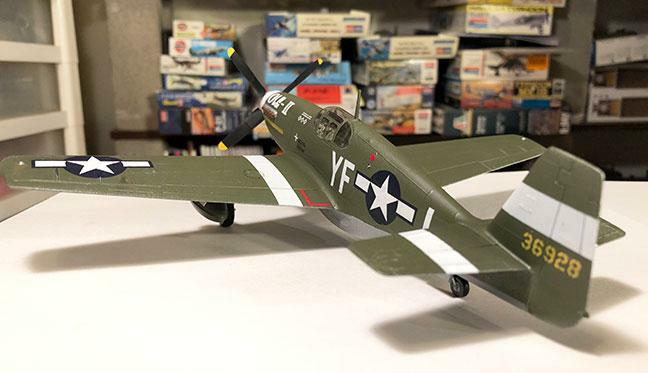 Here’s my favorite Monogram kit of all time, the 1/48 P-51B. Over the years I must have built at least six of these (with another 5 in the stash). It is the original mold kit, not the Pro-Modeler re do that came later. It was built pretty much OOB, with decals from the Tamiya kit. 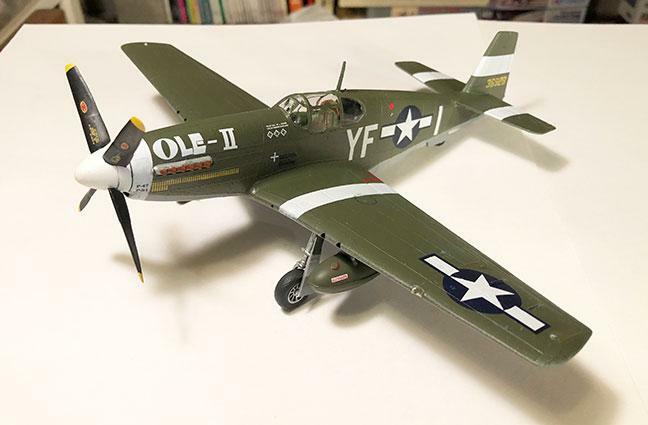 Paints used were Tamiya Neutral Grey and Olive Drab (USAAF) in rattlecans. Markings are for William J. Hovde 355th FG. If you find you need a change from all of those super detailed kits, try one of these. You will love it! Typical of Monogram’s “old” offerings. Well worth the [little] money spent compared to the cost of today’s “super kits”. Very nice job on this, sir. You HAVE to love the old Monogram kits – they are the real modeler’s playground where you learn the trade. I love these old kits. You’ve done very well, Brian and that looks a hell of a stash in the background. Nice job Brian, I’ve only built one of these and had a lot of fun doing it. Not a lot of parts, shape seems to accurate and it’s a quick build. Just needed some AM decals, nice post. Brian, Nicely done on the old classic. Is this the kit that has the engine built into the kit and the separate upper portion of the cowling ? No, this is the old 1967 release. Great ‘B’ bird! , Did a blue box monogram millennia ago, recently did the 1/72 version, Love the old classics. Great-looking Pony. Yep – those old kits provide some great modeling! What has Steve gone and done now? Sikorsky Sea Hook…………..